Bats usually roost in dark, quiet, enclosed spaces where they are least likely to be disturbed by predators or inclement weather. 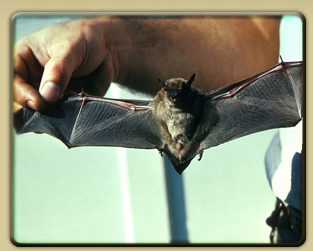 Bats can fit into openings as small as 1/2" making almost every man-made structure a potential hiding place. Their natural habitats are caves and other secluded areas and this is why your barn, shed or attic can be perfect for bats to live. A word of caution about Bat droppings (Guano). They can carry a fungus known to cause Histoplasmosis. Don't breathe the feces and avoid contact with it. It’s time to call the experts at Cages by Jim. Bats \’bat\ Mammals that belong to the order Chiroptera (ky-rop-tera), which means, "winged hand". They are the only true flying mammals.